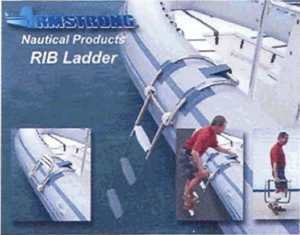 Lifesaving and safety equipment: the RIB Ladder by Armstrong Nautical Products The RIB Ladder from Armstrong Nautical Products is designed to allow a person in the water to board a RIB over the side rather than having to climb in over the transom. It folds up out of the water and can easily be removed and folded for stowage. In the past, a person climbing aboard a RIB would typically climb over the transom using the engine as a footrest or ladder. The Jury recognised that this product eliminates potential damage to the engine and removes the swimmer from a potentially dangerous area.